The index declined 2.4 percentage points to 108.5 in August from July. The index was 0.2 percent lower in August 2016 than August 2015 (108.7). The index is currently at its second-lowest reading in 2016, after January (105.4). September sales will fall between seasonally adjusted annual rates of 5.1 million and 5.44 million. This is down 1.2 percent from August. This is also down 5.1 percent from one year ago. 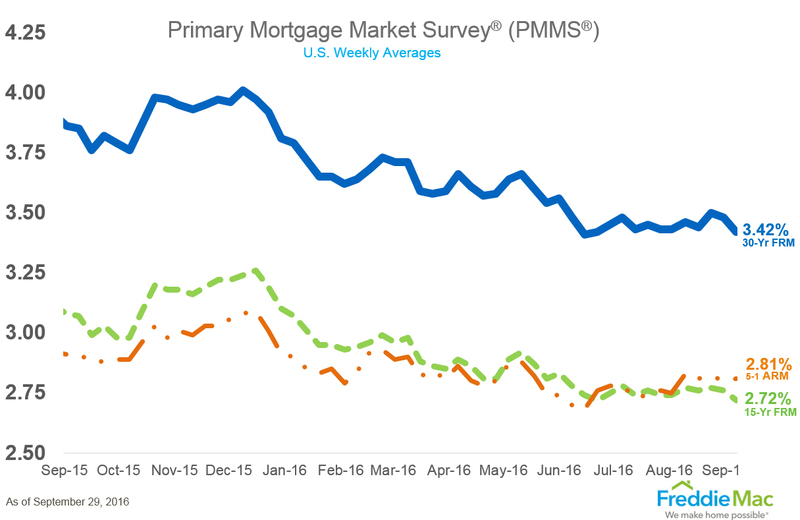 The 30-year fixed-rate mortgage (FRM) averaged 3.42 percent with an average 0.5 point for the week ending September 29, 2016. This is down from last week, when it averaged 3.48 percent. One year ago, the 30-year FRM averaged 3.85 percent.